Every post in WordPress can be filed under one or more tags. This aids in navigation and allows posts and to be grouped with others of similar content. Tags are normally displayed either around the post title or at the end of the post. They can also be featured in sidebars, for example using the Tag Cloud Widget. Unlike categories, tags have no hierarchy so there is no parent/child relationship like that of categories. But like categories, tag names must be unique. This screen allows you to create new tags, and to edit or delete existing ones. The tag slug must be unique. The tag slug is used in the URL for the tag. For example, setting a tag name of “Recipes” and a tag slug of “food” would show all “Recipes” posts with a URL like blog.com/tag/food/. If this field is left empty, WordPress will automatically generate a slug based on the title. Tag descriptions are optional. Benevolence does not show tag descriptions, so don’t worry about filling this in. However, you might find them useful from an administrative point of view. Once you have entered all the information, press Add New Tag to save it. It will appear in the tag table instantly. This table lists all of your tags by row. Tags are displayed alphabetically by tag name. [ ]: A checkbox that when clicked (checked), ‘selects’ that particular tag to be deleted when the delete action is applied. Name: The name of the tag. Remember each name must be unique. Click on the tag’s name to edit the tag. 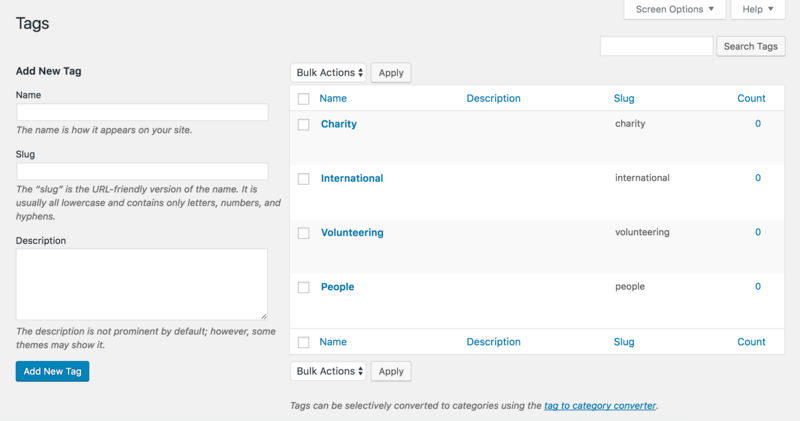 Quick edit is an immediate action performed on one tag by clicking the Quick Edit link, under the tag title. Quick edit is just an in-line edit box that allows you to change the name and the slug of a tag. Click Cancel to abandon your changes to this tag, or Update to save them.